Dimitri Rotov over at Civil War Bookshelf has an interesting post on his blog here in response to my two posts on railroads during the civil war: “Were the North and South Equally Matched… On the Rails” here and “Railroad Generalship” here. 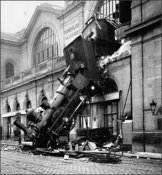 The dramatic photo on his post is that of a French train whose brakes failed at Gare Montparnasse is 1895. 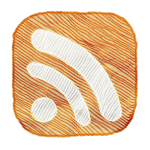 If you’re so inclined, you can read about that disaster on the Danger Ahead: Historic Railway Disasters website here. I am quite impressed that the New York Times has digitized and made available on the web many of their stories written as far back as the 19th century. I find them extremely useful. Case in point: In my Historiography class, we are actively discussing German, French and American historians i n the 18th and 19th centuries. George Bancroft , pictured right, (see my earlier post on Bancroft here) is a topic of discussion not only because of his status as the preeminent American historian of the 19th century, but because he was heavily influenced by German thought on – among other things – historiography. One topic led to another and eventually to a discussion about Bancroft’s views on slavery. 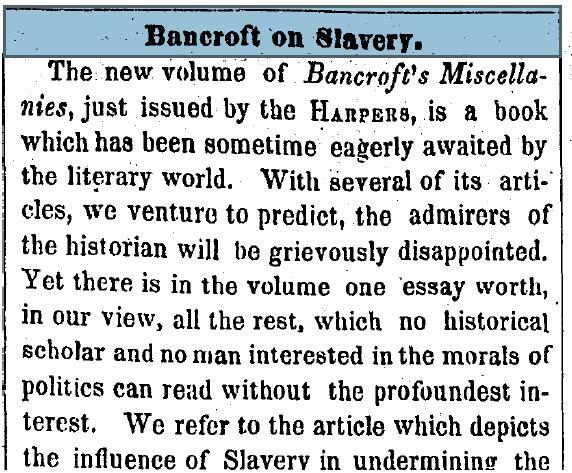 As it turns out, a review of Bancroft’s then upcoming work Literary and Historical Miscellanies, was published in the New York Times on June 12, 1855 and titled “Bancroft on Slavery.” This was easily found using Google search. One can preview the article here and read it in its entirety in pdf format (see snippet below). How cool is that? 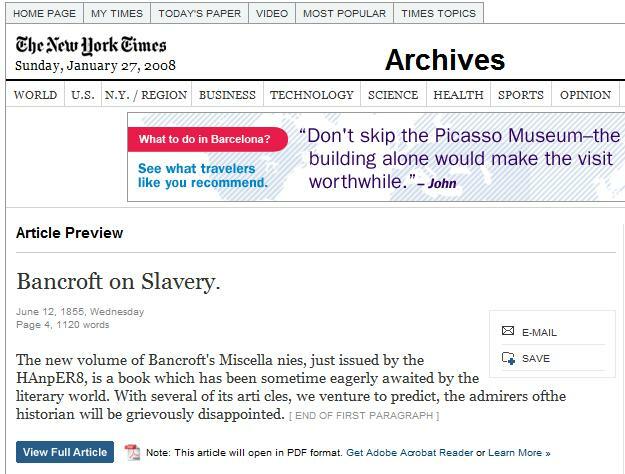 I’m sure the New York Times derives benefit from the advertising placed even in their archives section. I’ll put up with a few ads to not have to travel to the library and look up articles on microfiche. THANK YOU to the good folks (whoever you are) who made this decision at the New York Times. Oh and THANK YOU Google Books for making Bancroft’s Literary and Historical Miscellanies available online in its entirety as well. Now if we can only get more dissertations into Google Scholar. Today I received for review a copy of HOW THE SOUTH Could Have Won the Civil War: The Fatal Errors That Led to Confereate Defeat. Author Bevin Alexander claims to destroy the myth of the inevitability of a Union victory. I plan to read it with open mind. Following up on yesterday’s post “Were the North and South Evenly Matched….on the Rails,” which is essentially about railroad management during the American Civil War, I wanted to add some additional information and links that will allow further exploration if you are so inclined. This quote is from the report summary of the archaeological dig of the Alexandria, Virginia United States Military Railroad Station, a fascinating look at one of the busiest sites of the war. 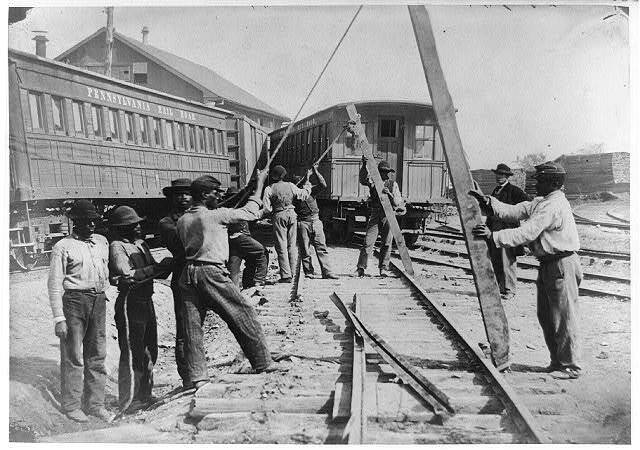 By the war’s end, there were 10,000 men in the United States Military Railroad service. Many were ex-slaves. Dr. Christopher R. Gabel (OSU and Command and General Staff College) has written an interesting piece titled “Railroad Generalship: Foundation of Civil War Strategy” available here. 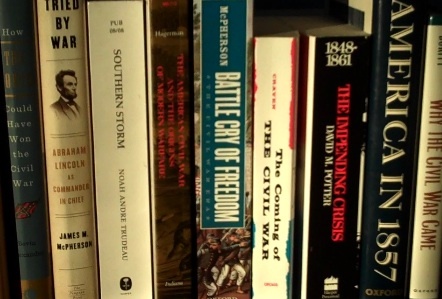 A bibliographical listing of works dealing with railroads during the Civil War (and other American conflicts) is available here. Were the North and South Evenly Matched…on the Rails? Our task was to take a stand on whether the North and South were evenly matched. I decided to focus on the very specific area of railroad transportation during the war. Part of my interest in this area comes from my association with friend and rail historian Peter A. Hansen, the editor of Railroad History and author of a number of articles for Trains Magazine. I was able to interview him on the topic and have included a good part of that in the post below. The photo below will be included in the upcoming issue of Railroad History which “is given over to a nearly-encyclopedic overview of every company that ever built steam locomotives in America.”[ii] The principal contributor is John H. White, Jr., former curator of transportation at the Smithsonian Institution. 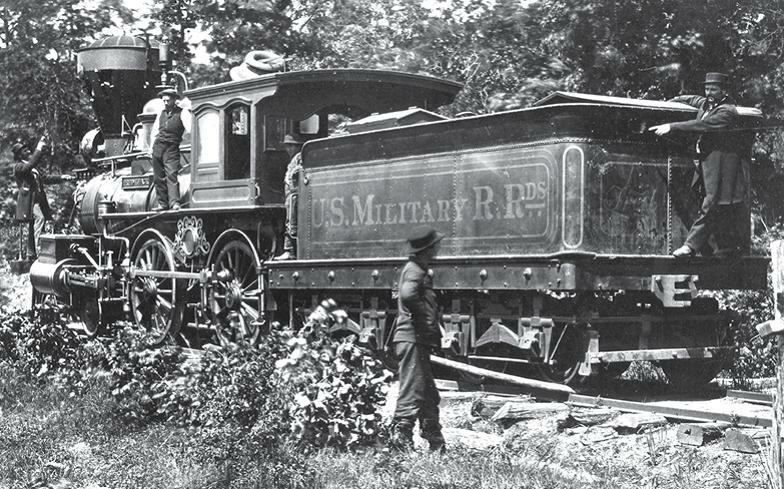 Photo: New Jersey Locomotive & Machine-built 4-4-0 Fred Leach near Union Mills, Va., on August 1, 1863, the year after it was built. Its stack and tender have taken cannon shot, and the main rod is missing. It became Orange and Alexandria Warrenton after the American Civil War. Library of Congress: 111-B-185. Photo above: Station at Hanover Junction, Pa., showing an engine and cars. 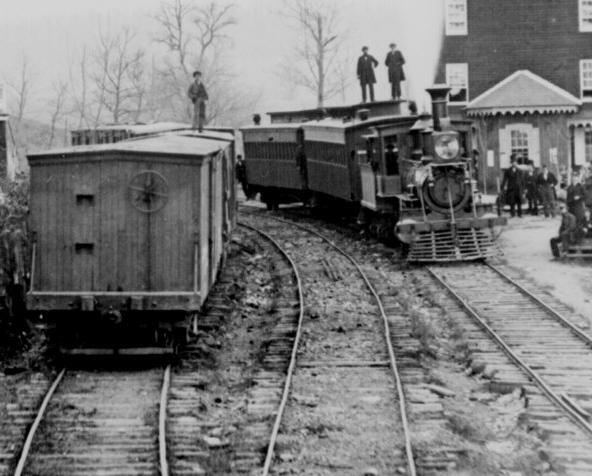 In November 1863 Lincoln had to change trains at this point to dedicate the Gettysburg Battlefield. LOC: 111-B- 83. Photo below: The four-tiered, 780-foot-long railroad trestle bridge built by Federal engineers at Whiteside, Tenn., 1864. A guard camp is also shown. Photographed by George N. Barnard. LOC: 111-B-482. Photo above: Tredegar Iron Works. Artist: Alexander Gardener, Public Domain, Wikipedia Commons. Photo right (cropped): James Noble Sr. from www.civilwarartillery.com/manufacturers.htm. 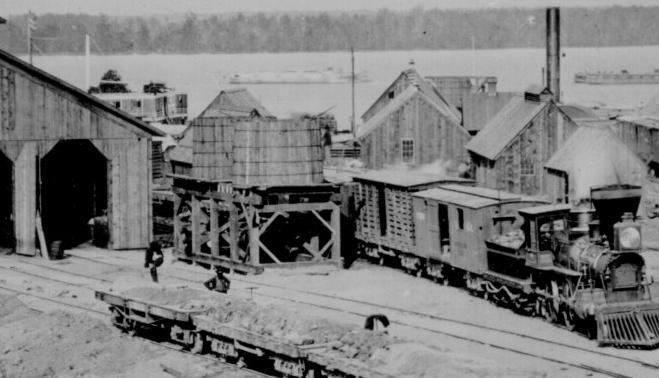 Photo above: Depot of the U.S. Military Railroads, City Point, Va., 1864. LOC Reproduction #111-B-4860 (This image cropped from original). Thomas Ziek, Jr. came to the same general conclusion in his Master’s Thesis, “The Effects of Southern Railroads on Interior Lines during the Civil War.” He tried to determine whether or not the South enjoyed the advantage of interior lines and concluded that they did not. My conclusion, for this area of focus, is that the North and South were NOT equally matched either in their physical rail assets nor in their management of those assets. 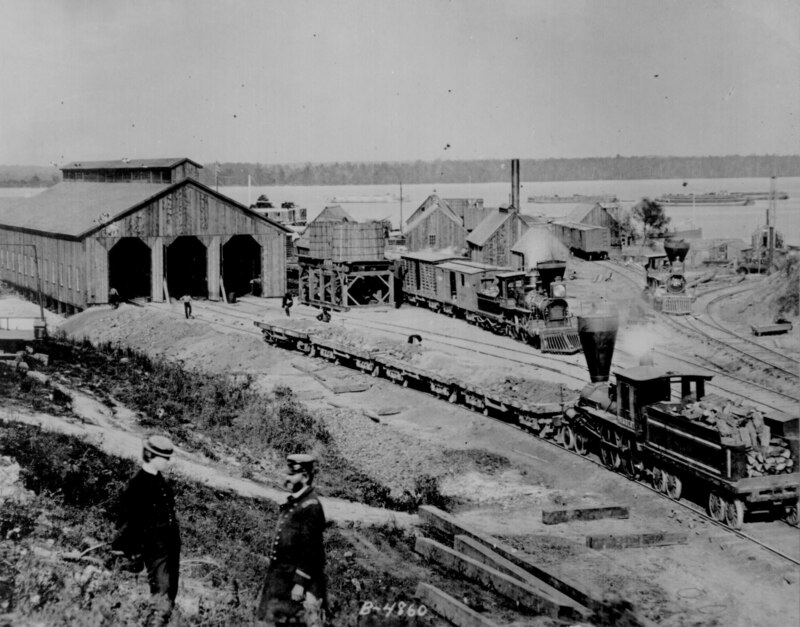 While the South had some moments of brilliance in their use of railroads, they simply did not have the infrastructure to maintain, let alone expand, the railroads of their region to their greatest advantage. [i] White, Charles, AMU CW500. [xv] Ziek, Thomas G., Jr., “The Effects of Southern Railroads on Interior Lines During the Civil War.” A Master’s Thesis. Continuing from the post Death and Injury on the Battlefield Part I here, this post deals with battlefield injuries. If shot by a Minie ball, a soft lead bullet fired from a rifle musket, a soldier’s wound was likely to be large because these .58 [caliber] bullets would deform and tunnel on impact. [iv] “Dr. E. I. Howard of the Army of Northern Virginia described the effects of Minie Ball on bone: ‘… wounds of bony structure inflicted by this missile are characterized by extensive fissuring and comminution such as was rarely, if ever, seen when the old smooth Bore musket was the weapon of the soldier.”[v] Amputation was the rule for gunshot or shrapnel wounds that involved major blood vessels or large bones. “Roughly 50,000 amputations were performed by both sides during the Civil War, compared to around 4,000 in the First World War.”[vi] Men shot or severely injured in the abdomen or chest wounds almost always died and so were rarely treated. Those who worked in military hospitals did so at great personal risk. Many of them contracted diseases themselves and perished. 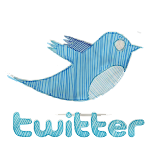 Common in the literature is record of the absolute despair that existed there. This would, no doubt, make for a great story in and of itself at some point in the future. For more on weapons carried during the American Civil War, see the previous post The Weapons they Carried here. For good coverage of how amputations were performed during the Civil War, click here. [i] Penny Johnston, “A Healing History of North and South,” History Today, January 1997 [database on-line]; available from Questia, http://www.questia.com/PM.qst?a=o&d=5000399106; Internet; accessed 29 September 2007. [ii] Ibid., [iii] Ibid., [iv] Ibid., [v] Ibid., [vi] Ibid., [vii] Ibid. 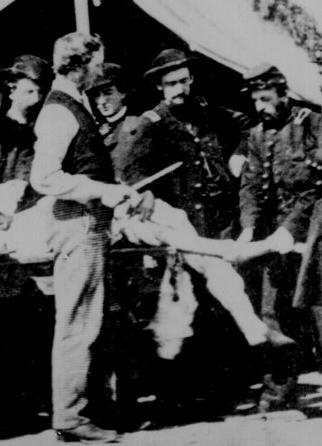 Cropped image of Amputation Being Performed in a Hospital Tent – Gettysburg, PA, July 1863. LOC. 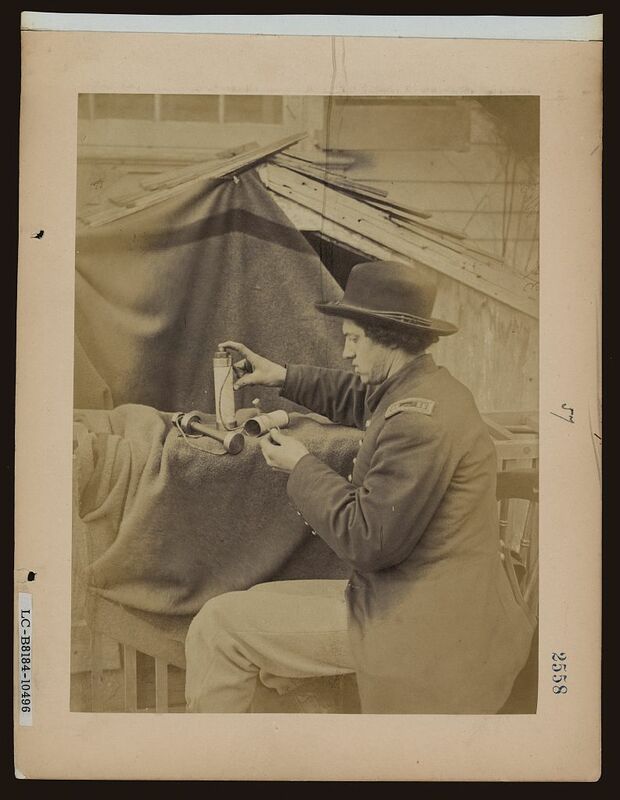 On November 24th, I posted a piece on the impact of disease on soldiers in the Civil War [see “On Lice, Disease and Quinine” here]. The following discusses the other side of death during the war, the experience on the battlefield. Please be aware the the following is very graphic. 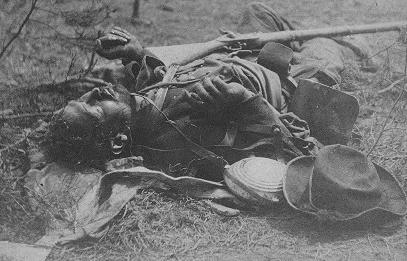 [Photo to left: One of Ewell’s Corps as he lay on the field, after the battle of the 19th May, 1864. 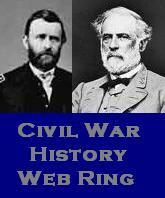 ]Battle injuries in the civil war were horrific and many led to death. The journals of soldiers and photographs of the dead tell of injury and death caused by cannon balls, grapeshot, canister, musket balls, bayonets, clubbing and more. Men were decapitated, cut in two, blown apart, shot in head, body, and/or extremities, bashed in the face or skull, disemboweled, burned, dragged, drowned, and/or suffered broken bones. John Beatty provided a glimpse of the carnage typical on most Civil War battlefields in a journal entry describing his pass through the battlefield of Stone River in Tennessee, early in 1863. I ride over the battle-field. In one place a caisson and five horses are lying, the latter killed in harness, and all fallen together. 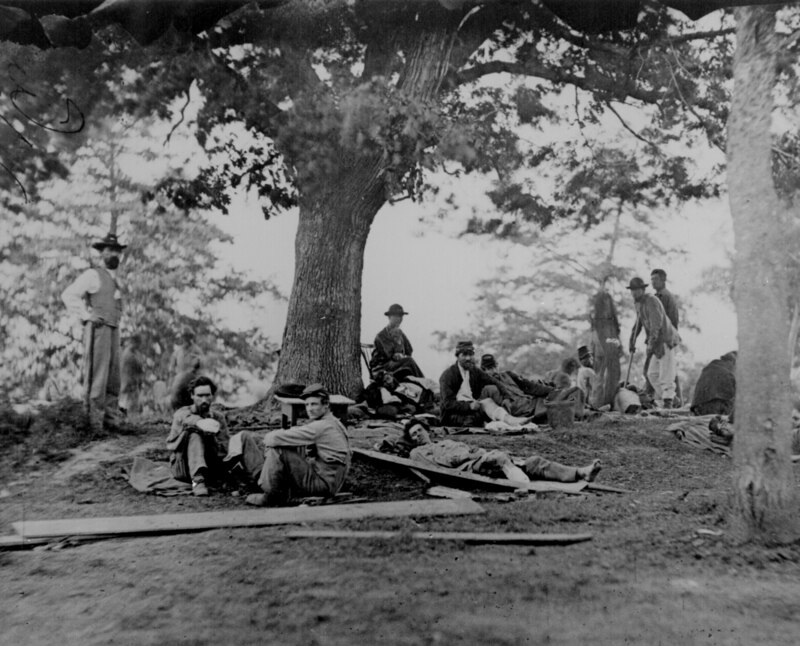 Nationals and Confederates, young, middle-aged, and old, are scattered over the woods and fields for miles. Poor Wright, of my old company, lay at the barricade in the woods which we stormed on the night of the last day. Many others lay about him. Further on we find men with their legs shot off; one with brains scooped out with a cannon ball; another with half a face gone; another with entrails protruding; young Winnegard, of the Third, has one foot off and both legs pierced by grape at the thig hs; another boy lies with his hands clasped above his head, indicating that his last words were a prayer. 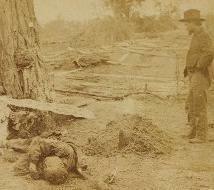 Many Confederate sharpshooters lay behind stumps, rails, and logs, shot in the head. 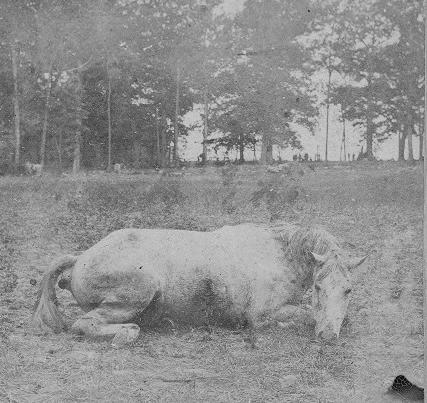 A young boy, dressed in the Confederate uniform, lies with his face turned to the sky, and looks as if he might be sleeping. Poor boy! what thoughts of home, mother, death, and eternity, commingled in his brain as the life-blood ebbed away! Many wounded horses are limping over the field. One mule, I heard of, had a leg blown off on the first day’s battle; next morning it was on the spot where first wounded; at night it was still standing there, not having moved an inch all day, patiently suffering, it knew not why nor for what. How many poor men moaned through the cold nights in the thick woods, where the first day’s battle occurred, calling in vain to man for help, and finally making their last solemn petition to God! Linderman posits that, even though the men fighting in the Civil War should have been more used to gore and death than those fighting in the next century, “when young soldiers first saw bullets, cannonballs, grapeshot, and canister strike others, their shock was profound. The first surprise was death’s suddenness,” a man alive and animated next to them one moment, and the next, lifeless and shattered. Men splattered with the insides of the man next to them were even more impacted. Also shocking was the magnitude of death. It was not uncommon to see thousands of bodies after a single battle. 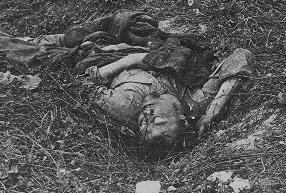 Many men died agonizing deaths after lying injured on the field for hours or days. Contributing to this were standing orders that prevented a man from stopping his forward motion to help a fallen comrade. Some men were also fearful that doing so would imply cowardice on their part. Also, rarely could a truce be made to remove the injured and dead from the battlefield. The resulting experience for the injured was atrocious. Methods and procedures that would allow for application of first aid and then rapid transport to field hospitals were simply non-existent. John Beatty, The Citizen-Soldier: The Memoirs of a Civil War Volunteer [book on-line] (Lincoln, NE: University of Nebraska Press, 1998, accessed 28 September 2007), 211; available from Questia, http://www.questia.com/PM.qst?a=o&d=26979264; Internet. Gerald Linderman, Embattled Courage: The Experiences of Combat in the American Civil War, 124.